University of Arkansas Museum photo 680270. One item very commonly used by Native Americans almost never survives archeologically—baskets. Baskets are one of the amazing things available for archeologists to study in the University of Arkansas Museum bluff shelter collections. 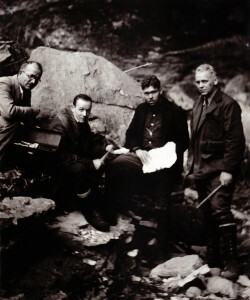 The Cob Cave Shelter in Lost Valley in the Buffalo National River was visited by Samuel Dellinger in 1931 early in his bluff shelter research. Many perishable items have been collected from this shelter including this almost complete tray basket—one of a set of five that were cached in the shelter more than 600 years ago. This object is fascinating not only because it gives us a material connection to the past, but also because it gives us information about the lives of the people who used this shelter. Lemke, Slate, Millard, and Dellinger in Cob Cave. University of Arkansas Museum Photo 310028. According to Dr. Elizabeth Horton, this type of basket is associated with the processing of corn. This basket from the cache in Cob Cave is a low-walled tray basket almost identical to baskets currently made by Native Americans in the southeastern United States to process corn. The basket would most likely have been used to winnow or sieve grains or seeds. 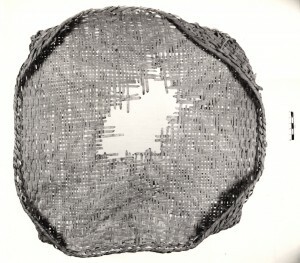 Contemporary tray baskets similar to this one are used by Native Americans to process corn into hominy. In addition, the archeological record does show that an increase in the number of baskets of this type occurs at around the same time as the introduction of corn into the southeastern United States. Cob Cave, where this example was found, was actually named for the number of corn cobs found here by early American settlers, so this makes sense. It also tells us that this shelter was being used as a specialized activity area rather than a year-round dwelling, because the narrow rocky valley it occupies is not suitable for farming corn. It would, however, be very useful for storing corn grown in the nearby Buffalo River valley. 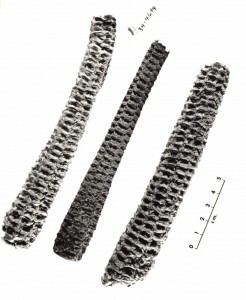 Examples of corn cobs recovered by Dellinger’s crews from Cob Cave, Newton County. University of Arkansas Museum photo 801105.